How can I add new pages? 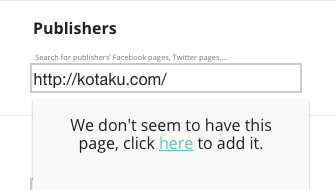 I can't find the page I want from the list of publishers. How can I add it to my feed? We're constantly adding pages to our system, but as new publications, celebrities, and other pages are constantly popping up, that job is never complete. That's why sometimes you might not be able to find the page you want from the list of publishers in the left hand-side menu of our tool. This means we do not yet have that page in our system. Click that button and it'll deliver your request to our system. We always try to get a page in within 15 minutes, but in off peak hours it can take longer. You can feel free to send us requests for multiple pages using the help button at the bottom right of the screen. If you have a document containing many pages, you can attach it within that message.